I recently wrote a preview for the game Hocus, which is currently seeking funding on Kickstarter. The TL;DR version of my preview is that I was quite impressed with Hocus. It’s short, it’s thinky, and like the best games my coworkers and I play over lunch, it caused a lot of discussion on the way back to our offices. (I even heard them continuing to talk about it later in the day.) This is a huge win, especially for a small-box card game. After that preview, I had a chance to interview the wizards behind the game, designers Joshua Buergel and Grant Rodiek. I tried to stump them with difficult questions, and instead they wrote intelligent answers that provide a fascinating window into their design specifically and game design in general. Here’s what they had to say. 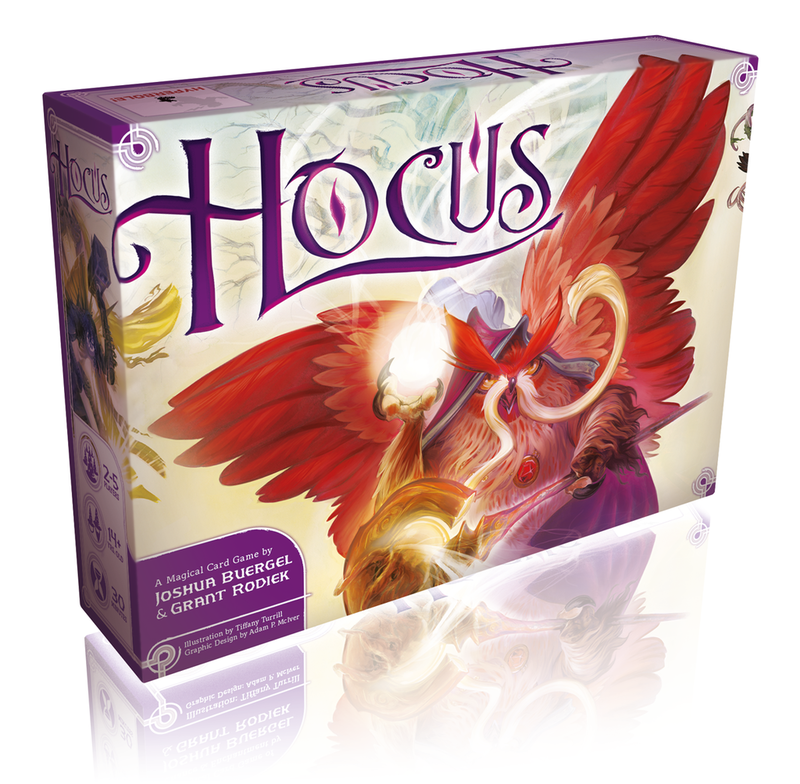 When I first heard of Hocus, I knew of it as a Poker variant. Yet, as I mentioned in my preview, the game plays and feels very different from Poker. What were your goals in designing Hocus? Josh Buergel: In a certain sense, there was no goal beyond creating an interesting card game. Grant had the idea of “Poker with spells,” and that was an interesting enough premise for us to continue following wherever it led. As we worked on it, I think it became clear to both of us that we wanted to make a card game that borrowed elements from Poker, rather than have a game that is first and foremost Poker, but with some changes. Obviously, there’s no denying the Poker DNA in Hocus, but we’ve intentionally tried to move to an area where it’s recognizable as having derived from there, but is its own thing. Poker is one of the truly great games out there, and it’s one that people have super strong opinions about and even relationships with it. The biggest trap for us with this game is to have people play it and just say, “Eh, I’d rather play Poker.” There needed to be daylight between Hocus and Poker, which is one of the reasons we dropped “Poker” from the name. Obviously, we’re both big fans of modern game design, and one of the biggest things you see from games these days is pressure. You’re always forced to balance multiple competing goals with limited resources, and you have to triage your opportunities. We’ve tried to add that tension and pressure into Hocus, with its multiple Communities, limited cards, need to increase Pots, and all the other things you’re trying to accomplish. Those are very different activities from a game of Poker, which is centered around probabilities, reading your opponents, managing your chips, and avoiding patterned play. Grant Rodiek: A much earlier version of Hocus we killed summer of last year felt very derivative of Texas Hold ‘Em. When we decided to can it, we took a step back and recognized that it was very derivative and lacked skill, among other things. When we began the journey to find the Hocus that is the final one, we did so through the lens of a) this must be a unique game and b) this must allow for skillful play. Those “razors” really helped us focus over and over again. Josh: Until we had that focus, of making sure that we included skillful play, we were drifting a bit with the game. It was sharpening up, we were learning more about this area, we were making progress, but it was kind of Brownian motion up to that point. I’m not sure we could have made Hocus the way it is today without some of that wandering in the wilderness, but having a north star to guide the design turned out to be really important. You both have other game designs that you’ve worked on. Aside from being collaborative, what new challenges has Hocus’s development presented? Josh: For what appears to be a simple card game, it’s been an unruly beast. There have been essentially five major revisions of the game–big, significant rewrites of essentially the entire thing. While the core has always remained “Poker with spells,” the surrounding details have been radically different, and things have developed. Here are some of the difficulties we’ve had to tackle. The first major version had significant runaway leader problems, which we had to correct. The next major version, what we called the 2.0 version, we actually had a game that was pretty fun. It worked, the game was functional and entertaining, my local game group had fun with it. But Grant felt like we needed to blow it up because there wasn’t enough skill in it. And it was true–that version of the game was the sort of game where you played some cards, and stuff happened, and it was entertaining, but the winner was essentially randomly selected. It also had a production problem of needing some kind of currency for tracking “mana,” which would increase the cost of the game by a fair bit if we needed to produce it. But we got far enough along with this version to actually get a printing quote on it before we blew it all up. That mantra, of needing to add skill to the game, was very tricky, especially when you added in the need to eliminate an external currency from the mix. We already knew that we didn’t want to have the skill come from pot/stack management, because we wanted to move away from Poker more. So we essentially needed to figure out a new core mechanic that would allow the players more control over the game, to give them the ability to compete directly and have that matter for their success. The third and fourth iterations were struggles along this line, with experiments with having “continuous” hands going, and alternate attempts at structuring the game. There was this kind of cool but confusing part where each player had a “showdown” spell they could play that would trigger a showdown under certain conditions. Even when we finally cooked up the structure of the game that Hocus ended up at, we still had a very big job in front of us to try and balance everything, which has been a real bear. Asymmetry is tough in any game, and with a card game like ours where the luck of the draw does matter, finding the signal in the noise can be very difficult. Grant: Some of the other problems that are obvious in retrospect were things like pairing the concepts of Poker, like hands and some of the terms, with things that are very much not Poker. We spent an extensive amount of time just developing and refining terminology. It was really tough and very frustrating. We learned a great deal about people who actually know nothing about Poker. How would we make our game exciting for them? There were also marketing concerns around pitching people who hate Poker, or think they hate Poker, or think we’re just a Poker variant. Therefore, in addition to difficult challenges like runaway leader problems, too much randomness, and balance issues with asymmetry, we also had to just figure out how to talk about the elements of the game in a way that worked with someone who has played Magic, Dominion, and Texas Hold ‘Em. It was a tough, unexpected challenge. Josh: One unexpected thing we encountered is related to that terminology point that Grant brings up. It turns out, for most people who have learned the Poker hands, that fiddling around with them is a bit of a third rail. Changing the definitions of those hands, changing the names of anything, changing the order, omitting any of the hands–that’s Very Bad, according to our testers. I think that people have invested enough mental energy in learning those hands that they don’t want anything coming along and screwing it up for them. Talk a little more about balancing asymmetry. I would imagine this would be very difficult. How do you know when you’ve achieved it? Grant: With an earlier version of the game, we boasted to ourselves that we had 26 unique spells and had tested and thrown away another 25 or so. We felt pretty smug. When we tore that version apart and decided it wasn’t good enough, one of the really harsh truths we had to admit to ourselves was that we had 26 spells that…basically just did the same thing. Just a variation on a theme. We knew with the next version we wanted very distinct spells. This was before we had the notion of asymmetry. We tested a variety of ways to obtain spells, including just randomly dealing them, in-game purchasing, a shared pool–all sorts of stuff. At some point, the idea emerged to just have all the spells dealt at the start, have them represented as cards, and have one spell equal one action. In hindsight, it seems shocking how long it took to get there. Then, asymmetry. There are a few ways to tackle it: different rules (Netrunner), content that is so different they might as well be rules (Dune/Rex), or different options within the rules (Summoner Wars). We took the latter path, which is nice as it keeps our core mechanisms dead simple and allows for Classic. Plus, it’s very simple for players to try a new spell book or to pick a favorite and gives us an obvious opportunity for expansions if spells allow it. I think you know you’ve achieved asymmetry when you’re playing, you take an action, and someone goes, “Ugh, that spell is broken.” Then you do a spell and someone else goes, “Now that is broken!” Then a third player in the corner uses a spell everyone thinks is weak and wins anyway. Everyone should feel like they are cheating, just a little bit. Everyone should feel special. And everyone should be a little envious of the other player. Josh: It is tricky to tease out what happened from play reports. Each play group brings a different perspective, and playing with different player counts also changes the dynamics. The best we can do is look for patterns among the reports, and if it seems like there’s a problem, to try and recreate it with our home groups and see if we can spot the problem. Is it a particular spell? The set of spells? Too weak, too strong? If we can reproduce the bug, then it’s fairly easy to fix. If it’s just reports of “We think X is too powerful” without more details, and we can’t figure out what we’re doing differently, it’s pretty frustrating. It’s funny. In one of my games, a player was using the Illusion book, and everyone thought his spells were way too powerful. Despite doing well, he didn’t win that game–so it’s not always a direct correlation between who seems to be winning and who will win. Grant: We actually did some balancing on Illusion because in some ways it was too powerful, but the real issue with your group, and many others, is that it’s just such an obvious power. A spell book like Flame is crazy powerful, but it isn’t immediately apparent. That perception is also something you have to balance, which is tough! In some ways, Hocus has been developed under a microscope, with blog posts and other iteration details appearing on Hyperbole Games months–years?–in advance of its Kickstarter launch. How has this impacted the design? Josh: It’s only helped! There haven’t really been suggestions we’ve gotten from the community, but it’s helped in at least three ways I can think of. First, we were able to get a reasonable group of playtesters together thanks to the relative visibility of the design effort. Getting good playtesters is hard, and it’s even harder for small companies. Whatever we do next will have an easier time finding testers thanks to the Hocus campaign, but getting those people invested with a new company is hard. Giving everybody a lot of information about things and assuring them that this is a real thing helped get us in the door. Second, it has forced Grant and I to be honest about where we are with the game. We have had to really put a bow around our thoughts in order to post about it, and hashing out our public information has given us some additional insight into where things were going. Just being forced to explain design decisions and the like is a valuable exercise. Finally, our long public iteration gave us some crucial early credibility on Kickstarter. The people who had been paying attention knew that we had been working on this game, hard, for a very long time. It didn’t come out of nowhere. That credibility, combined with the professional artwork and graphic design and the low price point, all combined for a very fast start that has led to a very successful campaign. The visuals and price meant we would have done okay, but the third leg of that stool of presenting the game itself as a worthy design, really helped multiply those early backs which leads to a virtuous cycle. Grant: When you’re a nobody in a crowded space, you really need to seek out methods to distinguish yourself. People don’t know who we are, they don’t know our games, and they don’t have a good reason to spend $15 with us versus so many other established companies with amazing games you can take home right now. We are generally open people, and generally not afraid of theft. If anything, I think I’m more afraid of speaking too soon about something. In the past, I’ve written about games long before I should have, which is just silly. We’ll be quiet about future games…until we know they are “a thing” and will be worth discussing. With all of that in mind, it just seemed like a simple, low-cost way to just build rapport and establish credibility. We have nothing to hide, we’re working our butts off. Seems like a good thing to share. On the other hand, it seems like sharing a work in progress invites all sorts of feedback–warranted and otherwise–into the design space. How do you distinguish signal from noise? Josh: By and large, you get feedback that’s fairly easy to sort into a few categories. 1. The nitpickers. These are mostly people who comb over the text of your shared documents and find things like typos, grammatical goofs, terminology inconsistencies, and other copyediting sorts of things. This is genuinely useful stuff, in terms of creating a professional package. The real value here is discovering where your copy is unclear, needs to be cleaned up, places where folks are going to get tripped up. However, these folks aren’t all that useful early in a project, since you’re likely to be changing a bunch of text anyway (and reintroducing these sorts of errors). How you deal with them depends on where in a project you are. Early, and you should try and just very quickly clean things up for them. Late, and you should try and dig in and understand the problems they bring up, because they could be indicative of some larger issue with your copy. Grant: And to quickly jump in, in some cases, an inconsistency isn’t really a problem. We said “a five-player game” and “a game with five players” in our rules, and that’s just not a concern. You need to put your mind in the space of a consumer and think, Will this affect my ability to learn and have fun? You can spin forever if you let yourself. At one point, early in the year, we had these Frankenrules that had clarifications for every brain type and every person who wanted to learn every detail at every point. They were long, unwieldy, and confused. We were a little upset, and it was because we weren’t acting as developers, just sponges letting in every piece of feedback. I remember being stuck on a plane in Frankfurt, and I e-mailed Josh, we discussed what needed to change, and I wrote the new rules by hand on a notebook. First thing I did when I got home was type them up, and we’ve stuck to that simpler, core set since then. We’ve had far fewer complaints, and they’re simpler. Folks mean well and want to help, but you need to remember that you’re the executive producer of your game. You have to know best in the end and make the call. Josh: 2. The players. These are folks that are are happy to take a look at things. You can get them to assemble a set for your game, if you’re persistent, and perhaps they even play it a time or two. Still, the best you’re going to get from them is “It’s fun!” or “I didn’t like it!” These folks by and large aren’t really thinking critically about the game; they’re just kind of giving you a binary thumbs-up or -down. Useful validation, perhaps, but there often isn’t a lot to parse. 3. The philosophers. These are folks that can’t resist just talking about design generalities when presented with a thing. Every discussion with them isn’t a problem and solution dialog. It’s a “what if this game were an entirely different thing?” kind of conversation. The dead giveaway here is if you express your design criteria to these folks and they immediately start trying to modify it and build on it, you’ve got yourself a philosopher. If you’re not looking for collaborators, then it’s best to just kind of acknowledge these folks and move on quickly. Grant: I work at a video game studio, so I’m surrounded by philosophers. I remember testing with one senior designer who kept alternating between “Wow, I love this game!” and “What if you did X!” It was hilariously scattered. He was clearly having fun, and in his actions didn’t really have problems with the game, but he also couldn’t stop himself from just spinning on ideas because, well, it was possible to do something else. Josh: 4. The cheerleaders. People that are just really happy that your game exists. I love cheerleaders, but they don’t really provide feedback, either. 5. The unicorns. Those rare, blessed souls who try your game with a critical eye, and give you detailed feedback about what they like, what they don’t like, and most important, why. Even one of these testers makes a measurable difference in the final game, and again, they’re easy to recognize. Fundamentally, you’re out there fishing for unicorns, so to speak. Anything else that happens around your design is either easily addressable, ignorable (but be polite! ), or is irrelevant. Getting your game out early gives you more time to attract one of these analytical people, and your public postings are the bait you’re using to try and get them interested in your project. It sounds like you both have similar views of the design process. What is one thing you’ve learned from the other in this collaboration? What insight did the other provide that you wouldn’t have thought of on your own? Grant: I think we complement each other very well. Josh has this crazy, vast knowledge of tabletop games. That’s probably his special power. I have 10+ years working as a producer in the video game space, and I think that’s my special power. We both have a passion for good rules and detail. We both love games that aren’t afraid to add a little fat. There’s an obsession with elegance, and both of us really love games with quirks that fill a valuable role. I’m trying to think of a concrete example. What we ended up doing was deeply collaborative where we’d spitball and go back and forth. Play cards to the community? That might have been me? Having multiple communities? Maybe Josh? But how we got there was entirely both of us. I cannot really find a part of the game that is just my fingerprint or just Josh’s. Josh: We could reconstruct some of those ideas, but one of the great things here is that neither of us wants to do that. There are no things in this game that either of us thinks is their baby. If I point to one thing that Grant did better than me on this project, I’d point to some of his big-picture restlessness. On multiple occasions, he took a step back and asked, “Is this good enough?” He relentlessly kept his eye on that ball, and it was really valuable for us making this as good as can be. You both are passionate about modern game design. What recent games have been inspirational to you? Josh: It’s funny, in terms of card games, most of my inspirations are older games. Uwe Rosenberg’s card games are a huge influence on me (Bargain Hunt, Bohnanza, Klunker, Space Beans, etc). Karl-Heinz Schmiel’s Was Sticht? and Frank Nestel’s Mu are both big influences as well. And, of course, I’m a huge fan of traditional card games of every stripe. Thorsten Gimmler’s No Thanks, Wolfgang Kramer’s 6 Nimmt, and Michael Schacht’s Coloretto are also inspirations. All of these games have, at their core, one or two really great ideas and then just enough elaboration around that idea to make sure that those core ideas really shine. So, we’ve tried to think in those terms, of having a core idea or two and then making sure we have a setting around it to make the core shine. Grant: I’m hugely inspired by Netrunner. It’s my favorite game and one that I own every piece of content for. I play it every chance I get (which is relatively often), spend time deck-building, and just think on it constantly. It’s a heavy game, but every card is individually simple. There are so many possibilities, yet strong constraints. I love the imagination it allows in play. You can see its hooks in Hocus, Farmageddon, and Landfall. I learned Combat Commander: Europe last year, and it blew me away. It’s one of the most dynamic games I’ve ever played. The cards do everything, and they do so much. As you play, a Russian hero might emerge to charge a machine gun nest, a blazing inferno might grow from a smoke grenade to engulf the forest and force you to abandon a position, or you might just encounter mines and seek a new way around. What do you do when a sniper picks off your lieutenant? It’s a beautiful game about chaos and dealing with things. You can see this inspiring Project Cow Tools and anything I make with multi-use cards (see: every game). My group has also really taken to Merchants and Marauders and Clash of Cultures, both by Christian Marcussen, lately. These games are big and “trashy,” but their individual components are very simple and well designed. To me, they are great examples of thematic integration with mechanics. They are broad, expansive, and really tell a good story, while also forcing you to think and play intelligently. Both definitely inspire Sol Rising, which will be a much smaller game, but one I hope feels big. Finally, any time I play Innovation, I think, “Wow, look what he did with a handful of cards.” It somehow feels thematic and really expresses a technological leap forward. It’s a great small civ game and one I cannot fathom how to tune and balance. Josh: We’re both huge Carl Chudyk fans. I think he’s a genius, and he does it so often with just a deck of cards. My list of designers that are must-buys actually tends towards the heavy end of things, with folks like Vlaada Chvatil, Vital Lacerda, Jeroen Doumen & Joris Wiersinga, Uwe Rosenberg–folks like that. I think Antoine Bauza is a genius as well. I’ve really enjoyed almost every Feld game I’ve played. What you see if you break down even the big games from these folks is how carefully constructed the incentives are. Every mechanic has a purpose in shaping the types of decisions people are making, and the reward calculus they have to make. There aren’t any shaggy rules in these sorts of games that are just there off to the side lookin’ cool. And I think trying to get into that mindset, about thinking how mechanics are pulling their weight, can be really valuable. I don’t necessarily want to close out the possibility of mechanics that are just pure chrome, but I think that kind of thing needs to be intentional. You should be aware that you’re just putting a hood ornament on your game and just own it. That’s quite an eclectic list! Back to your own designs, what is your “white whale”? What is a design that has so far eluded you that you’d love to accomplish (either on your own or together)? Grant: I recently began my fourth major revision of Sol Rising in over two years. I received a rejection from a publisher that was actually very optimistic, and I think I know what the game needs. I’m trying to make this narrative tactical fleet game. I want to mix story and theme, with choice. I want it to be relatively simple, not bogged down in rules. That one has had several good versions, but the perfect one eludes me. As for white whale, I’d love to make a CCG. Maybe not the exact business model, but a game like Netrunner that is fundamentally built around preconstructed decks with tons of possibilities. I’m not even sure I am a good enough craftsman to do it, but I’d like to. Josh: Spend any time with me and you’ll discover I’m obsessed with dungeon crawlers. And I will make the ultimate dungeon crawler. It’s going to be huge, extensive, and there will only be twenty people who will want to play it. But those twenty people are going to love it. I have a set of smaller designs I’ve been chipping away at for ages, but none of those are stuck; they’re just waiting for me to get back to them. But the dungeon crawler in my brain. That’s the one that haunts me. Anything else you’d like to add, on Hocus or otherwise? Grant: Firstly, we really appreciate you doing this. I love talking shop. Secondly, we’ve worked really hard on Hocus. We’ve really worked to craft a game we love the past 18 months, and we stand behind it. It’s tested so well and is a game with both still love to play, 100+ games in. Josh: This project came from a genuine love of games. We both play all the time, and we made this game to last. I feel like we succeeded at it, and I guess people will tell us if we did or not. It’s exhilarating to think that even this many people will see our work. As for in general, the best thing I can say to folks is if you want to design or contribute to the hobby, get involved with testing. There are many designers out there trying to get feedback on their designs. Pick one and help out! You’ll learn a lot about design, and it might turn into something more exciting. My involvement with Hocus began as a tester. My involvement with GMT Games began as a tester. It’s not difficult to stand out from the crowd as a playtester, and people will want you more involved very quickly if you are engaged and provide good feedback. You never know where it’s going to lead, and it’s a worthwhile activity on its own. Many thanks to Josh Buergel and Grant Rodiek of Hyperbole Games for their perspective on one corner of the board game hobby. Their game Hocus is currently overfunded on Kickstarter, and the campaign runs through Friday, July 24. I suggest checking it out–I don’t think you’ll be disappointed. This article is a paid promotion.